Modeled after Marshall's highly acclaimed Dual Super Lead amp heads, the gig-ready DSL40CR guitar combo amplifier delivers Marshall sound in a portable package. The Marshall DSL40CR blasts 40 watts of tube-driven sound through one 12" speaker, and features all the road-ready controls you'd expect on a Marshall amp, including a Resonance control for bass boost, Presence control for added highs, 3-band EQ with a "Tone Shift" button for notching out the mids, and even a digital spring reverb. For veterans and beginners alike, the DSL40CR makes it easy to rock like a champion. Stomp the footswitch to toggle between clean to distorted channels to add some crunch. Stomp the Reverb button to add quacky spring-like sounds or deep moaning lows with professional-quality digital reverb and separate reverb controls for each channel. A shared EQ section offers treble, mid, bass, presence, and resonance controls, giving depth to your tone whether you're filling the room with screaming tubes or softly strumming with warm, natural overdrive. And thanks to its all-tube design, this Marshall amplifier is sure to leave an impression. With tube-driven preamp and power sections, the Marshall DSL40CR will sound like an amp twice its size. Two channels with independent gain and volume knobs for each channel make it easy to change the mood at the press of a button. A gain boost button is also provided for each channel, in case you need to "take it up to eleven," and a switch on the back lets you switch to half power (20 watts) for when you're just practicing. 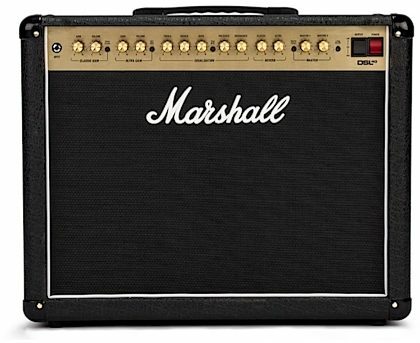 Any guitarist knows that nothing sounds quite like a Marshall tube amp, but you can't lug around a half stack each time you want to jam -- and that's why Marshall introduced the DSL amplifier line. Plug into Marshall quality in a portable guitar amp with the DSL40CR combo. The new DSL models feature adjustable power settings, which delivers all-valve tone & feel, at any volume, from bedroom to stage. The new technology adjusts power to the valves, instead of just turning off valve stages, allowing the amp to remain articulate, & dynamic. Our partnership with Softube(R) has led to the creation of award-winning plug-ins, as well as exceptional tone in our CODE digital amps. The same team is responsible for the development of the new emulated output feature, found in the DSL series. Both the headphone out, and line out on the DSL models boast incredibly accurate emulation of our famed 1960 cabinet. The DSL is now more versatile than ever, with new features including discrete master volume controls for each channel, built-in reverb and resonance controls (the DSL1 & DSL5 do not offer resonance controls). Overall: Good tones, very veristile. Can be played at bedroom levels or stadium volume. Doesn’t matter. Some said it can’t be done but here i am playing at bedroom volumes and it sounds more than acceptable. Obviously sounds better cranked cause it’s a tube amp but I like to use it for both so I don’t have to have a bunch of different amps lying around for different applications. Marshall cleans, 70-90’s rock tones to nasty grindcore metal tones if desired. The reverb is comical, non existent almost. Nothing a pedal can’t fix. My first Marshall ever and probably not my last. I have been tone chasing for about a year now and have gone through 10 amps in this price range-ish. I can’t see myself letting it go so that says something to me. Downfall is the reverb and the footswitch pedal that comes with the amp. Doesn’t give you full access. Does give you channel change from clean to dirty and the effects loop. Which works perfect for me as I use a pedalboard anyway and could care less. But if you don’t have a pedalboard I could see it being annoying not being able to turn on and off certain things. However like I said if you use pedals it's a non issue. Highly recommend. Ordered from zZounds, came fast (2 days), received as promised and never have issues with zZounds. Simpley the best! Overall: Incredible amp !! My SG and Lp are amazing into this. This amp needs no pedals. You have so much to work with, the gain stages and the switching channels. Just set you master right and you can play anything. I did try my fenders into it and i believe they are best in my fender 68 CDR. No downing..just feel Gibson into Marshall and Fender into Fender is where the Mojo is. You will not be disappointed in this amp...its loud and proud but also a finesse amp...i could pull off jazz and then go right in 80's metal and even beyond that into nasty-metal, i even dropped D tuned for a few minutes just cause i felt that "power" only a marshall cranked can do..so all in all..one of the best amps i ever played into...just got it today and it makes me want to play. Did a full set a band practice and ..man does this thing cut ! !